I've really been into nails recently and have been experimenting with lots of different designs and techniques including ombre, glitter fades and nail stamping. It really is easy, doesn't take too long and the best bit is you can pick up all the tools you need for only £7.86! The first thing I do when painting my nails is to make sure they are prepped well. This really does make your nail varnish last so much longer. Personally, I use shellac cnd polish (you can read all about how to do shellac nails at home here) as it lasts much longer (around 2 weeks) but I use normal nail polish to do the stamping part in-between the colour and the top coat. For this particular design I used CND Gotcha but you could use any colour you like to do the stamping on. Ciate cupcake queen is also similar. 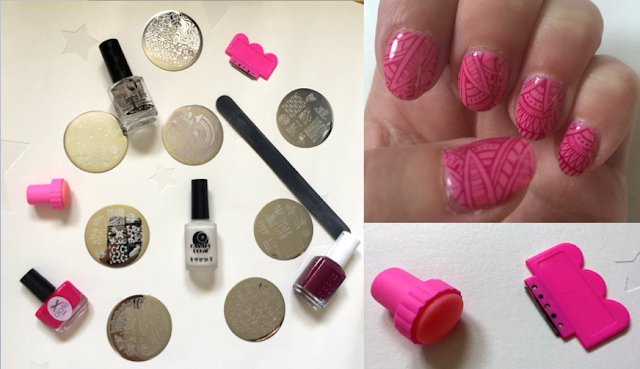 The most important thing is that you make sure your colour is totally dry before stamping. Before stamping your nails, I use the OKO peel off tape around the edge of my nails to create a barrier so that the stamp does not go on my finger. This really does save time at the end as you can just wipe it off and your nails are perfect! After you have painted your nails as normal I used the born pretty plate no.55 to do the design. For this design I chose Essie's bahama mama as it is darker than the Gotcha polish and will stand out. I normally choose much darker colours or very light grey/white. I place a generous amount on the design plate I want so that you can't see the plate through the nail varnish. I then use the scraper to take off the excess polish and swipe it off in one movement. I then take the stamper and press firmly down on the plate so that the design is transferred. For the perfect finish on the nail, I have found that rolling the stamper from side to side gives a better finish as I curve it to the nail. When I have finished one hand, the design is dry and I place a top coat layer to seal and protect the design. I would love to see your designs if you try this out, tag me on instagram!